Last edited by bruceames; 03-17-2015 at 03:29 PM..
EST (electronic sell through) quarterly data (from the DEG Report). YoY = Year-over-year growth in EST sales. % BD = sell through percentage of BD vs. OD. Last edited by bruceames; 08-22-2014 at 04:19 PM..
OD (Blu-ray + DVD) sell through has been up 2.3% the last 5 weeks, thanks to stronger new release titles compared to last year, as well as the release of Star Wars and The Lion King on Blu-ray. Thanks for posting this Bruce! I also noticed that Q3 was very impressive (for BD but much less for OD), but Star Wars and a 12% YoY increase in box office strength cannot be ignored. Curious to see the post POTC YoY trend lines. This is the list of $200 million plus summer movies. After POTC, all will have been released except HP 7 and the Hangover 2. * Number 2, 5, 9 and 10 movies of 2010 all topped $200 million but were released in March or November, including March released Alice in Wonderland that topped $300 million. Last edited by bruceames; 09-16-2014 at 05:41 PM.. I appreciate you posting this PSound! 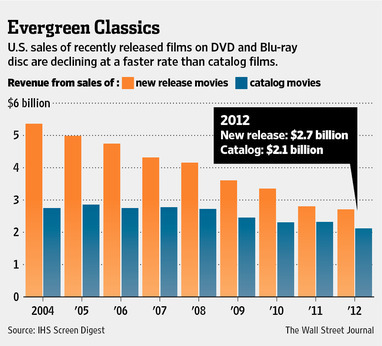 It looks like box office in Q4 should be rather favorable. I wonder if it's possible that OD could actually register a gain for the entire quarter. Sure PSound, and welcome! I thought it would be nice to have a sales thread in this forum, on all formats HD and those that affect HD sales. I too am curious as to how POTC sales will turn out on BD, as well as later on DVD. Noticed that the POTC pricing is rather high ($24.99 is the cheapest you can find it AFAIK) and the only real sales are on the more expensive 3D set, so that should throttle sales somewhat I would think. If so, then the DVD only version should see decent sales when it comes out since it's $7-8 cheaper. Do you have a Q4 release schedule? My current feeling is that we are probably going to be looking at POTC week being the high point for YoY % growth in Q4 with a steady decline in percentage at that point. I expect Q4 to be very strong overall, but for comparisons to be tougher going forward. I think Q4 will be very strong. All of OD being up for the quarter would be very impressive and a welcome relief for studios. No, I just keep track of what's already been released. I get that info from the BD.com release calender. After POTC4, there's less heavy box office power remaining than what's been released already. Here was the 2010 blockbuster release schedule (Sept-Dec). Notice that the box office power is more heavily distributed towards the last two months of the year. These AAA quality catalog titles are doing very well. I expect JP trilogy to do very well. Best Buy is selling steelbook versions of the set. Too bad they are G1 sized. Adding in these DC and DVD into the case forced them to do it. A trilogy will fit into a G2 case if you dont have more than 3 discs. OH well. P.S. Holy crap. I just noticed my avatar. George forman grill. LOL. LMAO, yeah that's a hilarious avatar Chip. Yeah it seems Blu-ray is releasing some top catalogs this fall. Star Wars, The Lion King and Jurassic Park. I wonder what tent pole titles they got left in their bag? Jaws would be a big one. Indiana Jones trilogy and Titanic.